New Delhi: National Human Welfare Council (NHWC) felicitated talented professional in various fields with “Bharat Shri” award on Sunday for outstanding contribution in their respective fields. The Director (PR) of Goldmine Advertising Ltd. Mr Manoj Kumar Sharma was awarded “Bharat Shri” for his outstanding contribution in the field of Public Relations. The award was presented to Manoj Sharma by Lt. Gen.(Retd.) Raj Kadyan, the Chief Guest of the occasion at a glittering ceremony held at Press Club of India. 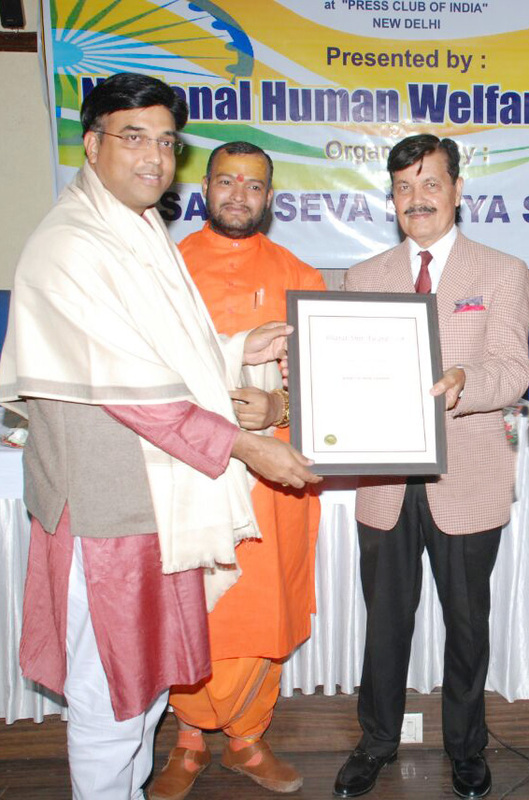 Several eminent personalities from different states in the field of Medicine, Science, Art, Public Relations, Education, Social work, Journalism, Sports, Industry, Poetry, Agriculture and Police, were awarded “Bharat Shri” for their notable contribution to the society. To name a few, Keshav, Kundan Kumar Rai, Smita Tandhi of Nari Shakti, Sadhna Mishra and Meera Parida are some of the awardees honoured with “Bharat Shri” on this occasion. Addressing the gathering Lt Gen (Retd) Raj Kadyan encouraged all the awardees to continue working for the welfare of the country. Shri Shankar Suhail, former Minister of Uttar Pradesh in his address said that “All of those awarded with “Bharat Shri” are experts in their fields and are doing commendable work towards nation building.